Epact: Nocturnal unsigned, late 16th century ? 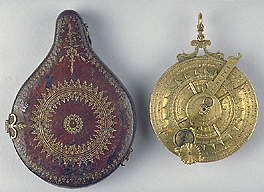 This instrument is neither signed nor dated, but comparison with similar instruments and the language used make it likely that it was made in the late 16th century in France. It consists of a nocturnal and a horizontal sun and moon dial on the front as well as a vertical pin gnomon dial on the reverse. Besides these more usual features there are also highly unusual tables of lucky and unlucky days on the reverse which serve astrological purposes.